The kidneys filter unwanted substances from the blood and produce urine to excrete them. There are three main steps of urine formation: glomerular filtration, reabsorption, and secretion. 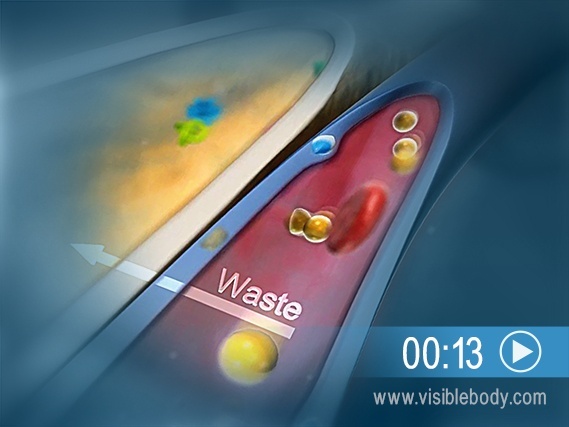 These processes ensure that only waste and excess water are removed from the body. Each kidney contains over 1 million tiny structures called nephrons. Each nephron has a glomerulus, the site of blood filtration. The glomerulus is a network of capillaries surrounded by a cuplike structure, the glomerular capsule (or Bowman’s capsule). As blood flows through the glomerulus, blood pressure pushes water and solutes from the capillaries into the capsule through a filtration membrane. 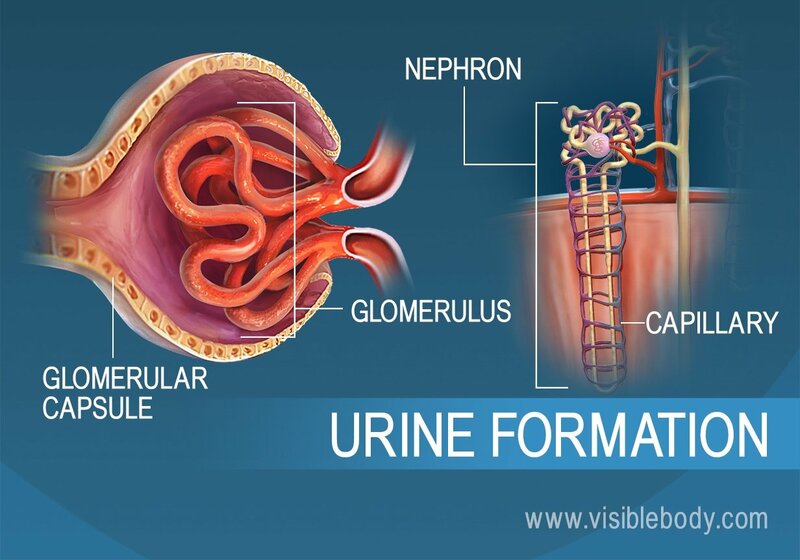 This glomerular filtration begins the urine formation process. Inside the glomerulus, blood pressure pushes fluid from capillaries into the glomerular capsule through a specialized layer of cells. This layer, the filtration membrane, allows water and small solutes to pass but blocks blood cells and large proteins. Those components remain in the bloodstream. The filtrate (the fluid that has passed through the membrane) flows from the glomerular capsule further into the nephron. 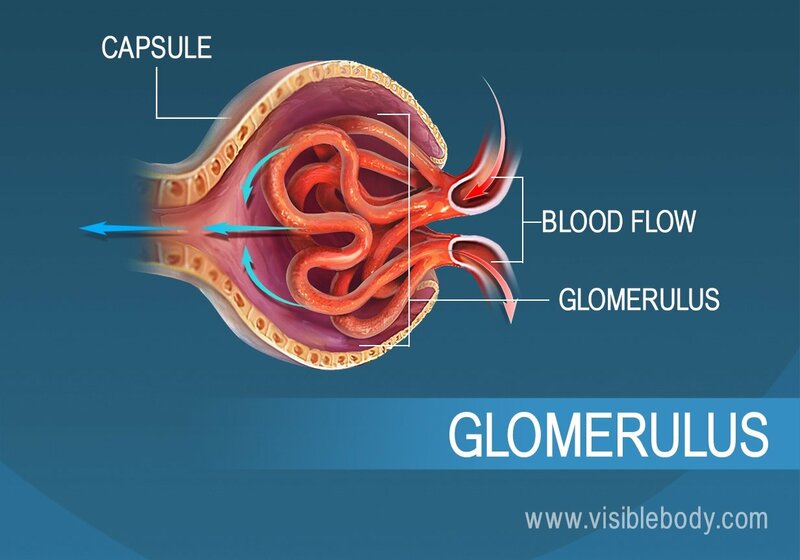 The glomerulus filters water and small solutes out of the bloodstream. The resulting filtrate contains waste, but also other substances the body needs: essential ions, glucose, amino acids, and smaller proteins. When the filtrate exits the glomerulus, it flows into a duct in the nephron called the renal tubule. As it moves, the needed substances and some water are reabsorbed through the tube wall into adjacent capillaries. 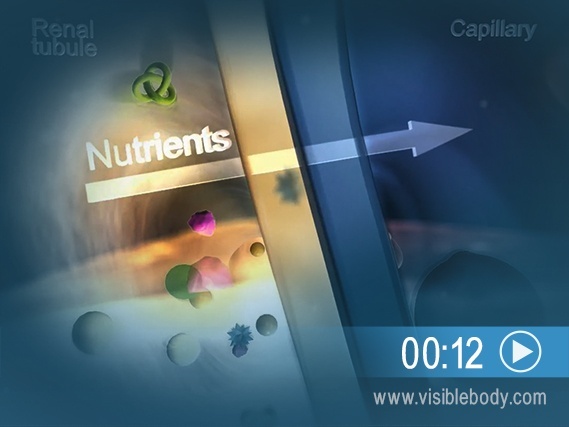 This reabsorption of vital nutrients from the filtrate is the second step in urine creation. The filtrate absorbed in the glomerulus flows through the renal tubule, where nutrients and water are reabsorbed into capillaries. At the same time, waste ions and hydrogen ions pass from the capillaries into the renal tubule. 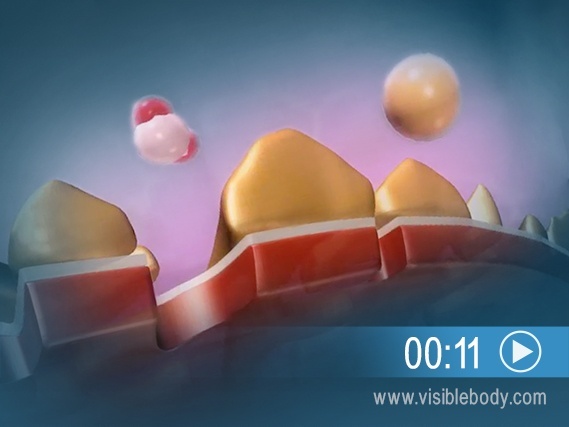 This process is called secretion. The secreted ions combine with the remaining filtrate and become urine. The urine flows out of the nephron tubule into a collecting duct. It passes out of the kidney through the renal pelvis, into the ureter, and down to the bladder. The nephrons of the kidneys process blood and create urine through a process of filtration, reabsorption, and secretion. Urine is about 95% water and 5% waste products. 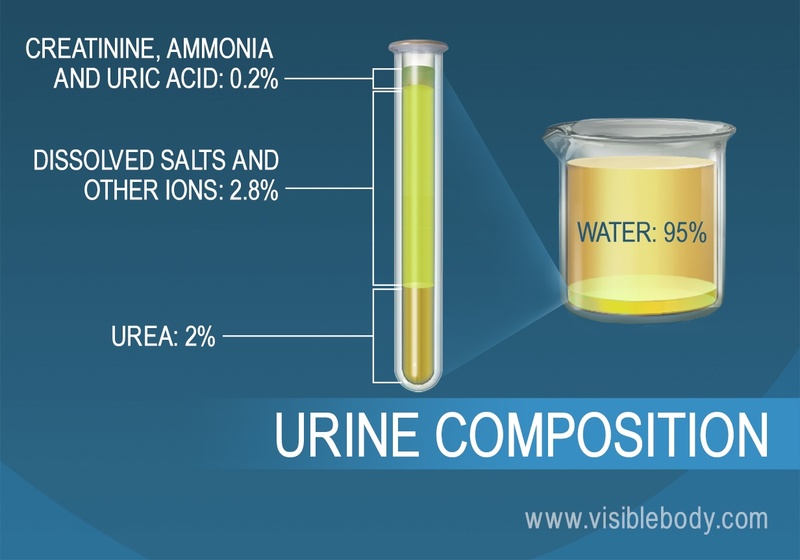 Nitrogenous wastes excreted in urine include urea, creatinine, ammonia, and uric acid. Ions such as sodium, potassium, hydrogen, and calcium are also excreted. “What’s in Your Pee?” from Popular Science.